How much do you know about the Auckland harbour bridge? Well, the Auckland harbour bridge took 4-years to build opened on 30 May 1959. It started with an open day which saw 106,000 people walk across the bridge – it was an amazing project in it’s time and had the nation wondering how this would change Auckland. But like many things, there is more to this story than just a bridge. Here is what I have found out about the Auckland Harbour Bridge. Prior to construction of the Auckland Harbour bridge the quickest way from Auckland to the North Shore was ferry or the long drive by road which took you via Riverhead and Albany which was a distance of approximately 50 km (31 miles). In the 1959 when the bridge was opened the North Shore was a mostly rural area of barely 50,000 people. My grandfather owned a home on a lifestyle block in Milford which boarded Lake Pupuke, but as things turned out had sold this to move to Hawkes Bay well before the bridge was built. As early as 1860 an engineer named Fred Bell was commissioned by North Shore farmers wanting to herd animals to market in Auckland and had proposed a harbour crossing in the general vicinity of the current Auckland harbour bridge. The plan to build a bridge failed then due to the large cost estimated at £16,000 which when adjusted for inflation (as of March 2017) would be $1.9 million. 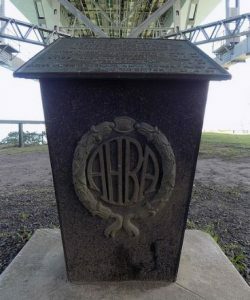 A plaque commemorating these men who fell to their deaths is located under the bridge at Stokes Point on the North Shore. But the bridge had another cost too with the loss of three lives. Of course at the time the loss of three lives was not considered high and when compared to other bridges that have been built it would be easy to argue that it was a low cost to pay. During the construction of the Sydney Harbour Bridge from 1923 – 1932 amazingly (and sadly) only 16 men died from bridge related work. During the construction of the San Francisco-Oakland Bay Bridge from 1933 – 1936 a total of 28 people died and the Golden Gate Bridge from 1933 – 1937 saw 11 people die. The Brooklyn bridge was one of the earliest large bridges and was built from 1871 – 1883 and 27 people died. The Auckland Harbour bridge is 1,020 m (3,348 ft) long, with a main span of 243.8 m, rising 43.27 m above high water. This height was to allow ships to access to the deep water wharf at the Chelsea Sugar Refinery and the proposed Te Atatu port which was mooted in 1949, as part of the government’s post-war metropolitan plan. It is the second-longest road bridge in New Zealand, and the longest in the North Island. It is now an eight-lane motorway bridge over the Waitemata Harbour joining St Marys Bay in central Auckland with Northcote in the former North Shore City. The bridge is an integral part of State Highway 1 and the Auckland Northern Motorway and today there are 61.5 million vehicles crossing the Auckland Harbour Bridge every year. As well as being a mechanism to move traffic, the bridge is now used as a launch pad for the adventurous Auckland Bridge Bungy.